Jar Jar Binks was the first Gungan to represent his people in the Galactic Senate, first serving as a Junior Representative along with Senator Padmé Amidala, and then, after her death, serving as full Senator himself. 1. Outer Robe consists of an ornate detailed design, mostly consisting of smaller squares, in hues of yellows, rust, browns and blues. The robe has two long tabards in the front with an angled design of the same material. The back has an upside down V pattern in the material and the front is a straight angle. The robe is slightly shorter in the front and longer in the back, nearly draping to the floor. 2. 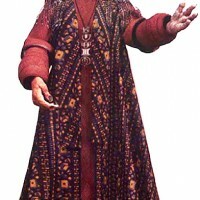 The Inner Robe is a burgundy or wine color. It has no colored design on it, but is textured with a pattern of lines. The sleeves are billowing on top and bottom, but gathered at the elbow. The lower part is detailed with a deeper wine trim evenly spaced along the forearm; there are four burgundy wine lines wrapping around the arm. The inner robe is long and flowing, and it reaches the costumers ankles or lower. 3. The Necklace is on a long black or dark brown cord. Necklace charms are metallic gold colored and strung vertically. The five charms should be of accurate shape and size, scaled to the wearer. 4. The bead work drapes off of the shoulders and around the back. The beads may consist of uneven mixtures of black, brown, amber, white, off-white, or colors in between. They are approximately 8 inch long strands and should be dense. 300 strands of beads minimum are needed to achieve the dense look around the shoulders and back. The shoulder pads have two detailed bead designs of inner woven colors of brownish black and amber to brown; 2 inches wide minimum. 5. Latex Mask to achieve JarJar’s face is required. The mask should be of high quality and consistent with the reference. The ears should billow and you should not be able to see the costumers face in any manner and the seams should be hidden. 6. Four fingered hands that are orangish-red with brown fingernails. 7. Three toed feet are large and painted orangish-red consistent with the rest of the costume. The toe nails are of a brown color matching the fingernails.